For a few days now, Chickadee's have been "in my face". They have been flying all around me it seems and I can hear their distinctive songs clearly. I have been thinking about writing about them in the blog for awhile now, but neither of my animal totem books have them listed as a spirit animal so I turned to other things. This morning the Chickadee's continued their persistence presence and I decided to write about them anyway. They seemed to deserve a blog post for sure. In turns out, from 7 different varieties of chickadees, the particular Chickadees I'm seeing (and today's picture) are Black-Capped Chickadee's. Apparently these guys are quite Canadian. They like the cold northern climate and are found throughout Canada and only in the northern United States. Maybe that's why they aren't included in some of the Totem Animal books. According to the Spirit Lodge website http://spiritlodge.yuku.com/topic/974 the black cap on the Chickadee's head is significant. The attention to the head identifies a connection to the thinking process, the higher mind and higher perceptions. The black color points to mystery and that ability to be tapped into higher knowledge, inner wisdom and help from beyond the obvious. Although they are only about the size of a golf ball, Chickadee's are a bold, courageous, creature. They seem to have no fear and are quite willing to battle other bigger birds if they have to. Their main survival skill is their ability to connect with that type of inner wisdom that allows them to recognize danger. If you mean a Chickadee no harm, you can quickly make friends with them. They will even land on your hand if you offer them a black oil sunflower seed or two. However, they won't go near people that might harm them and they seem to be able to sense the difference. Chickadees are very social birds. They flock together and will even accept other types of birds into their group. That familiar song for which they are named, chick-a-dee-dee-dee, is used to let other birds know when they have found a source of food. They seem totally willing to share their knowledge and express their truth. As a totem animal they represent cheerful and truthful expression. The Raven Medium website, www.ravenmedicum.com/TotemAnimals.htm writes that if you see a Chickadee when listening to advice, you should consider that advice as truth. The site suggests you could call on the Chickadee energy if you want to distinguish truth from fiction. The Chickadee can help you find the truth within your heart to guide your actions. Literature suggests there is great significance in the fact that there are 7 different types of Chickadees. The number 7 is considered to be a symbol of the individual rising from the material plan of life. It is also connected to the 7 primary chakras. Hmm.. The Chickadee seems to indicate balance in all seven chakras, but it points particularly to the 5th or Throat Chakra from where we are encouraged to speak our truth. http://pixiedusthealing.blogspot.com/2011/02/foods-for-throat-chakra.html When this Chakra is balanced we are able to express ourselves clearly and kindly, because our words come from a place of inner knowing and our heart. In Sweet Shack & Bach Bar, Rachael finds Throat Chakra balance. http://pixiedusthealing.blogspot.com/2011/12/its-here-sweet-shack-bach-bar.html The Bach Flowers that resonate with this Chakra and help Rachael find balance include Mimulus, Agrimony and Cerato. The positive aspects of those three Bach Flowers all seem evident in the Chickadee spirit. A few drops of Mimulus can help you face your fears with courage. 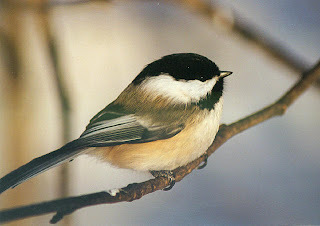 The Chickadee is able to be particularly courageous because it maintains a connection with inner knowing and thoughtfulness. It seems to face fears by thinking through them. The Chickadee is a risk taker. It puts itself "out there" in a cold climate, with lots of predators around but it adapts because it recognizes danger and acts accordingly. The Chickadee doesn't fear cold nights. Rather than fly to a warmer climate when the going gets tough, it just lowers it's body temperature by 10 to 12 degrees C on cold nights to conserve energy! It senses when that kind of danger is coming and takes action to avoid the risks. Chickadees and the Throat Chakra are both about "expressing self" and speaking your truth. The Chickadee has a number of songs it sings that all mean different things to other birds apparently, although to us it sounds very simple. Raven Dreamer at www.spiracanada.com/ravenDreamer/totems/chickadee.htm writes that someone with Chickadee as a totem animal tends to be a charismatic character that has no problem speaking in the center of the room about almost any topic. They can be the life of the party in a knowledgeable and natural way. They aren't subtle creatures but tend to dart about, clearly in the open where all can see. That type of energy can be found in the Bach Flower essence Agrimony. When balanced, Agrimony types are able to speak their truth openly no matter who the audience. But when the throat chakra is unbalanced or blocked, you may hide behind a mask of cheerfulness that isn't the way you truly feel. This can be expressed in people that present as the joker, or the life of the party, seeking social activities and distractions as a way to suppress their true feelings. http://pixiedusthealing.blogspot.com/2010/12/agrimony-to-release-whats-behind-mask.html Agrimony can help you connect with the balanced Chickadee energy of being able to be genuinely cheerful, in touch with your true feelings, and able to communicate freely what is inside you. A balanced throat Chakra, like the Chickadee energy speaks the truth and only the truth. This truth must be first found from the connection with your higher self, your inner knowing and that sometimes mystical intuitive side of self. In this aspect, the Chickadee energy seems to share a connection with the positive aspects of the Bach Flower essence Cerato. Like Chickadee energy, Cerato can help you listen to your inner knowing rather than be distracted by the misguided advice of others. If you need help identifying fact from fiction, Cerato and Chickadee energy can help. Chickadees show that, in nature, size doesn't matter. It's the power within you that helps you survive and thrive even when the going gets tough. We all need to sing our song, share with the group, and listen to our inner knowing. Here's to singing your true song! Thank you for your post! Funny - I've been trying to decipher the truth of a situation and while sitting on my porch, clearly heard (as though someone was standing next to me! )"chikadee" ... a few seconds later, a chikadee landed right in front of me. Finding your post, this makes sense. :) Sometimes, when an animal wants to make their presence known, they become unavoidable - as you mentioned. Your post is wonderfully written and a huge help! Thanks again! Thank you for your post! Funny - I've been trying to decipher the truth of a situation and while sitting on my porch, clearly heard (as though someone was standing next to me! )"chikadee" ... a few seconds later, a chikadee landed right in front of me. Finding your post, this makes sense. :) Sometimes, when an animal wants to make their presence known, they become unavoidable - as you mentioned. Your post is wonderfully written and a huge help! Thanks again! Yup- that Chickadee really wants your attention! Good luck with your situation! This was incredibly helpful. A few days ago in relaxed meditation, I saw one of these, but couldn't recognize it because I live in the South. Then, just today, as I was preparing to go into my first-ever group therapy session with my abusive parents, I was writing a draft of what I would say to them and saw one of these chickadees land on the bush outside my window. Reading this, I learned why it came to me and that it must be here after flying south for the winter. Thank you so much for such an incredibly thorough, fantastic resource!